Owners Don and Judy Phelps care deeply about the land and the surrounding watershed of Lake Chelan. They are proud to announce that the estate vineyard on Ivan Morse Rd. is the first LIVE (Low Input Viticulture and Enology) and Salmon Safe-certified vineyard in North Central Washington. They farm the land using organic methods with no chemical pesticides or weedkillers. Every thing from planting, weeding to picking is done by hand. Supporting and sustaining the native shrub-steppe habitat on the hillsides surrounding the vineyard. Pure, clear, glacial waters irrigate our vines and owners, Judy and Don Phelps are focused on developing and defining the terrior of the Lake Chelan AVA. There are 28 acres of Estate vineyards, all located on the North Shore and planted to varietals such as Chardonnay, Cabernet Franc, Syrah, Riesling and Malbec plus a few smaller, experimental plantings of varieties such as Aglianico, Grenache and Pinot Noir. Growing grapes and making wine here is still a big science experiment, allowing for experimentation with small plots of different varieties and different winemaking styles. But that is what makes it so exceiting. No rules to live by! Learning how varietals express themselves in this new wine-growing area that is Lake Chelan is what is driving the wines being made. To learn more about the Lake Chelan AVA, watch this interview with the soil scientist who helped write the petition for the AVA. It really is an exciting new grape-growing region! Judy and Don purchased the 25-acre vineyard property in Manson on the north shore of Lake Chelan when it was still operating as an apple orchard in 2004. Apple trees were removed from a six-acre piece on a southwest facing hillside to become the vineyard. This vineyard, planted with Cabernet Franc, Riesling, Sauvignon Blanc, Semillon, Gewürztraminer and Malbec produces wines of quality and complexity, owing partly to its southwest aspect and slope which allows for efficient air drainage. It is a windy site which leads to natural reduced vigor encouraging robust aromatics and supple tannins. Additionally the high elevation (1350 feet) provides cool nights which allow the grapes hang until well into October / early November without becoming over ripe. In 2016 4 acres were planted to gobelet-style head-trained Phelps clone Syrah. Look for the first vintage of this Syrah starting in 2018. Located near the winery on Wapato Point Rd and adjacent to Glacial Gravels but at a slightly lower elevation (1250'), this vineyard was planted in 2014. The plantings consist of gobelet-style, head-trained Pinot Noir, Chardonnay, Grenache and Aglianico. Vineyards on the south shore of Lake Chelan and from other local sources continue to add value to the overall wine program as the estate vineyards mature and comes in to full fruition. Grapes are sourced from Veranda Beach in Oroville near the Canadian border and outside any recognized AVA (Barbera), Rosebud Vineyard in Mattawa (Cinsault), and Doebler Vineyard on the Wahluke Slope for Primitivo. Clos Chevalle, a north-facing vineyard at 1380' elevation, on south shore of Lake Chelan provides the Pinot Noir for the sparkling wine program and Pinot Noir red wine. 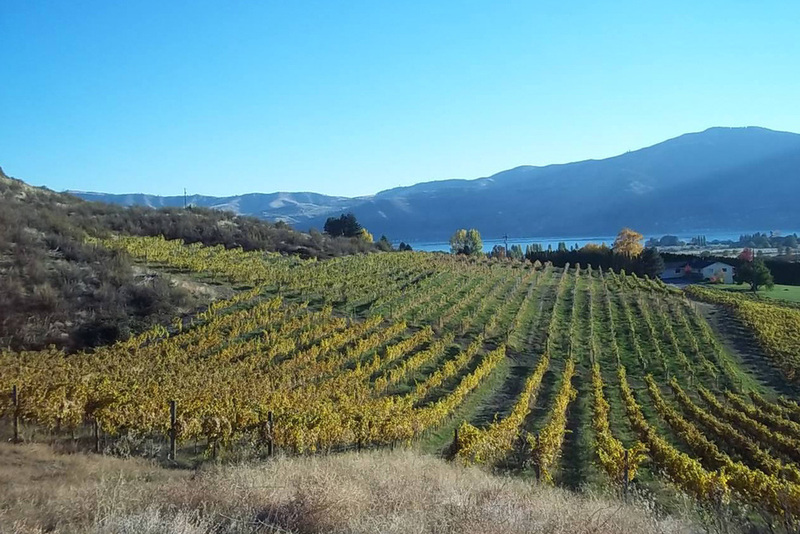 Muscat and Viognier are sourced from Jon Wadkins' vineyard ( 1390' elevation) above Chelan High School. In 2016, both Viognier and Syrah come from the venerable Defiance Vineyard on the south shore. The always trustful Hoe Mobile!